Good news / bad news time. First the bad: the Golden Sneeze has been napped from the museum of ancient history. Terrible, eh? Quite so, but fortunately, detective Hank is on the job, making the captivity of the perpetrator a simple matter of time. Provided you’re able to gather enough clues, that is. Clues which will only be useful for that particular playthrough, as the villain in Detective Hank and the Golden Sneeze is… randomly chosen! Needless to say, with several potential villains, there are also several – nine, in fact – different endings. Which ya get depends entirely on your wit. Or rather, choices made, clues found, interrogation methods, and so on. You know, detective stuff. Hopefully, all that hard work will eventually lead to a day in court, the recovery of said Golden Sneeze, and of course, a bad guy behind bars. So trust no one in this visual ‘whodunit’ novel, as for all you know, even the most innocent, trustworthy person could be behind the theft. Heck, could even be the protagonist! Wait, that wouldn’t make any sense… Right. Anyway, detective work awaits, and plenty of it too. So… help ensure that Hank will be remembered as the greatest detective ever, in Detective Hank and the Golden Sneeze! 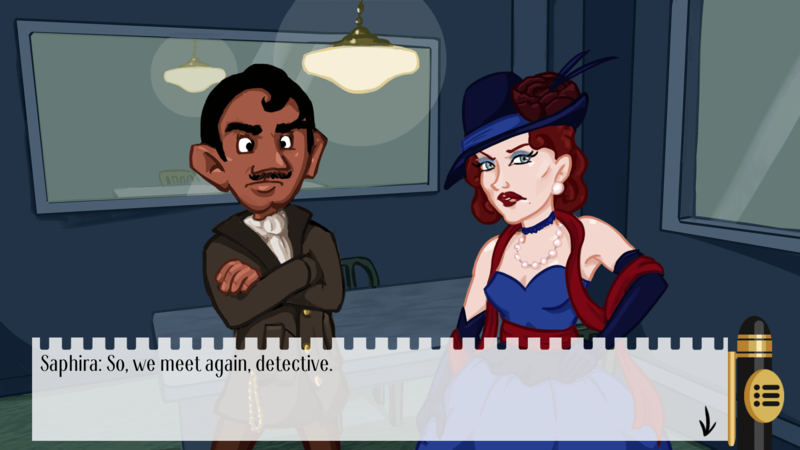 Detective Hank and the Golden Sneeze is available from itch.io, Steam and IndieGameStand, at $9.99.